Note: You can also use ground turkey, chicken, veal, pork or a combination. Use your imagination and create a vegetarian chimichanga with your favourite vegetables and meat replacement. Portabello mushrooms are a great meat replacement and work well in this recipe. Place ground beef in medium skillet. Add onion and garlic and red bell pepper. Sauté over moderate heat until onion is tender. Stir in ground beef, tomatoes, salsa sauce, parsley, chili powder, paprika, coriander, thyme, salt, cayenne and cumin. minutes, or until mixture is thickened. Stir in refried beans and black beans. Place 1/2 cup beef mixture in center of each tortilla. Fold opposite sides of tortilla to center over beef mixture. Fold ends toward center; secure with wooden pick. Chill for 15 - 20 minutes. Heat: 2 inches Crisco Oil in deep-fryer or large saucepan to 375ºF. Fry 1 or 2 chimichangas at a time for 2 minutes, or until golden brown. 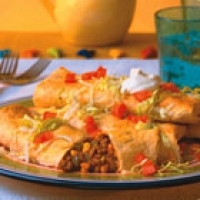 Sprinkle top of each chimichanga with 2 tablespoons of Monterey Jack cheese. Serve immediately on a bed of shredded iceberg lettuce with salsa, guacamole and sour cream, if desired. Cooking time includes the cooking of beef and deep frying. NOTE: The original recipe is from the CRISCO OIL Company but I have altered it. Oh Lor! What a great recipe! This sounds so delicious! I'll be making your recipe this week! Thank you so much for posting it.